When we first saw the photo, there was some discussion about who Aunt Tillie might be. Years ago, my new cousin’s aunt had guessed Aunt Tillie might be the sister-in-law of one of the women in the picture. We poured over so many photographs that for a short time afterwards, this one got lost in the crowd. Then one day when I was driving home from work, a light bulb went off. I don’t think Aunt Tillie is a sister-in-law – I think she’s a sister! My 3rd great-grandparents Nicolas and Marie-anne Schmitt had 13 children. All but two were born in France before the family immigrated to Ohio in 1854. The couple’s youngest child, Mary Mathilda was born in Cincinnati 06 Mar 1858. 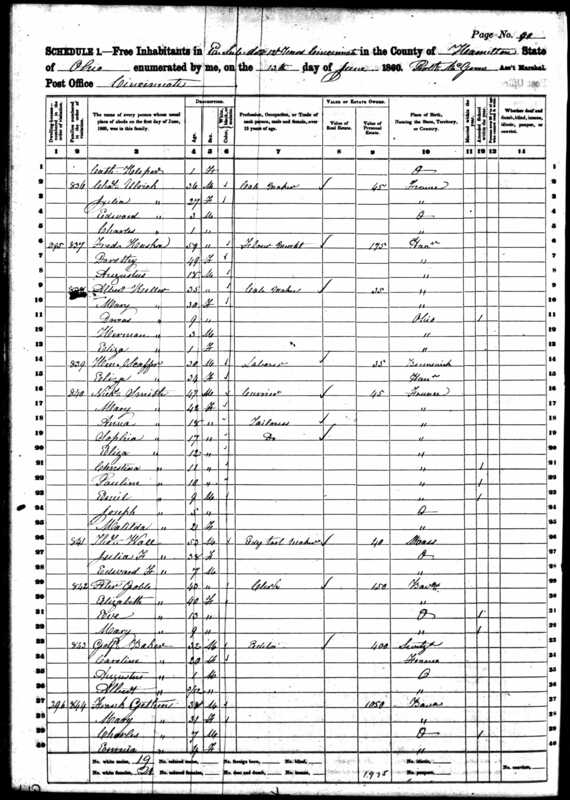 In her first census, Mary Mathilda is listed below her siblings – some of whom appear in the picture above. Tillie’s siblings from left to right in the photo are; Pauline born 24 Mar 1850, John born 16 May 1841, and Anna (Tante Plum) born 04 Sep 1844. 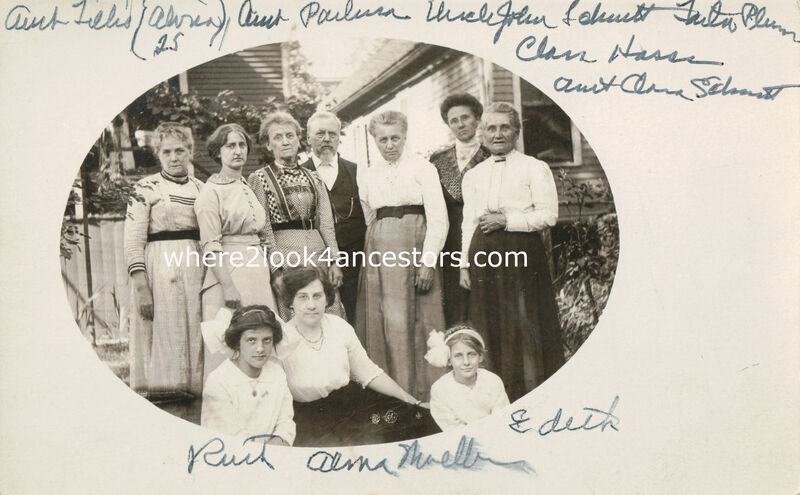 This picture allowed me to see – for the very first time – the faces of ancestors I have been researching for years. Thanks to my positively wonderful new cousin! I’m so excited to see this photo – and especially Alma! I feel like I know all these folks! It is fun, isn’t it? Especially now that we know where Alma died and where she’s buried. It’s been a discovery-filled couple of weeks!